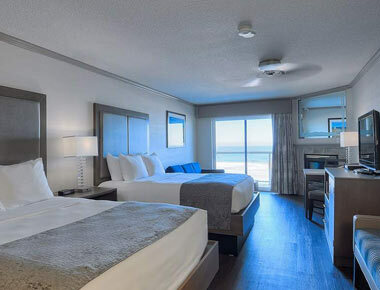 The Elizabeth Oceanfront Suites provides larger standard guest rooms to provide more comfort to any stay that you may be planning. Each spacious guest rooms comes with a king size bed or two queen beds, providing more guests with a better night sleep. Guest rooms are also offered in a variety of different sizes, giving you the best variety and quality. No matter which room is right for your trip, each one is fully furnished with modern design choices and quality standard in-room offerings. Relax with a large flat screen TV or catch up on social media with high-speed wireless Internet connections. Enjoy a fresh cup of coffee whenever you like with a Keurig coffee maker, perfect for enjoying on your balcony overlooking the Pacific Ocean. If you find that you forgot to bring something, our friendly front desk staff is available 24 hours each day to make your stay its best. The ideal choice for the family on the go is our large double queen bed room. The spacious floor plan and larger standard guest beds can provide everyone in your group the amount of space that they need for a great night’s rest. Enjoy a fresh cup of coffee with your in-room Keurig, or join us every morning for a hot breakfast buffet. 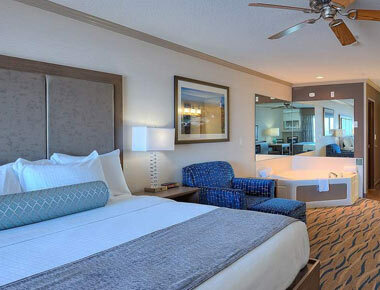 Our largest guest room combines a double queen bed and connects it to a single queen bed room. 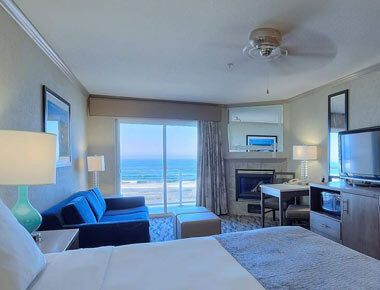 This room style can comfortably accommodate five guests without sacrificing your ocean views, in-room fireplace, or any of our other included amenities. Perfect for odd-numbered guests or large families, you’ll feel right at home. When you need better accommodations for smaller travel needs, the king size guest bed room is the perfect choice. 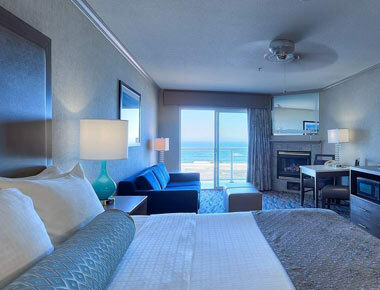 In addition to our largest guest bed size, you can also enjoy a couch and ottoman, in-room fireplace, a balcony overlooking the bluff, and a flat screen TV with premium TV channels. The King Jacuzzi guest room combines the comfort of our standard king bed room with the added privacy of an in-room Jacuzzi tub. Included in your stay are our comfortable guest robes, stemless wine glasses, in-room fireplace, and a private balcony, helping you to enjoy the perfect romantic weekend getaway.